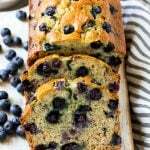 This recipe for blueberry banana bread is a moist loaf of the classic sweet bread that’s chock full of juicy blueberries. It’s the perfect snack or dessert option and can be frozen for later use! 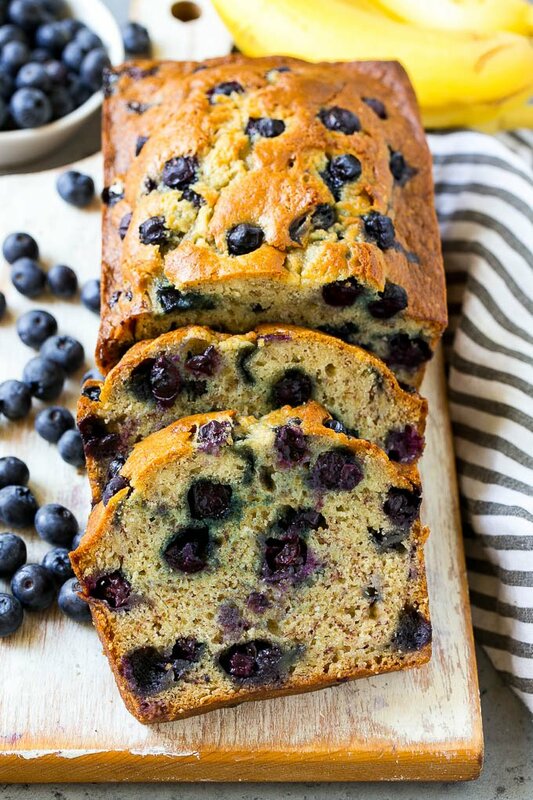 Banana bread is a classic recipe, but when you add fresh blueberries to the mix, you end up with an amazingly delicious treat that your friends and family will love. As I’ve mentioned before, my kids consume bananas at a rapid pace and it’s rare that we have any left over at the end of the week. If I want to actually cook or bake with bananas I have to hide them away so they don’t get immediately eaten! This blueberry banana bread is a favorite treat in our house – banana bread is such a classic treat as-is, but this version takes it over the top with plenty of blueberries in the mix. 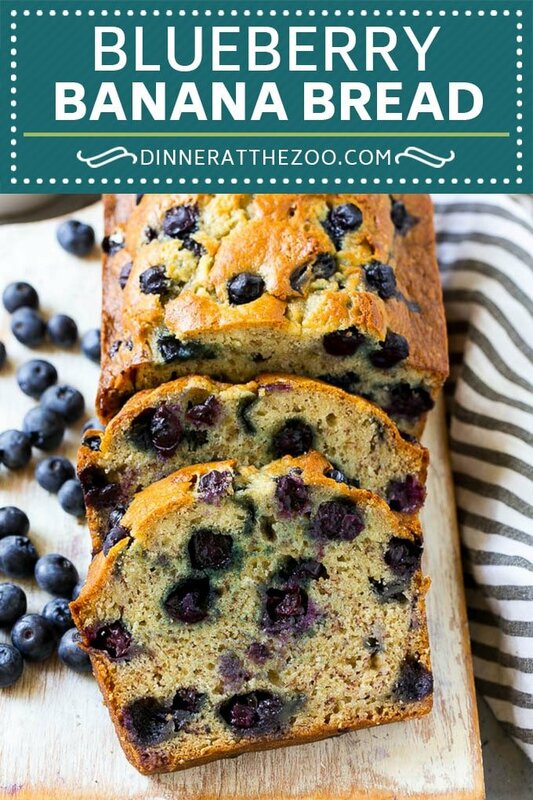 This blueberry banana bread recipe is similar to most other recipes in the banana bread genre with a few changes that make a big difference. A generous amount of fresh blueberries is added to the mix, along with yogurt for added moisture. You can also make this recipe with frozen blueberries but they’re more likely to turn the batter purple as they melt into the mix. Tossing the blueberries in a little flour before you add them to the batter will keep them from sinking to the bottom of your loaf. 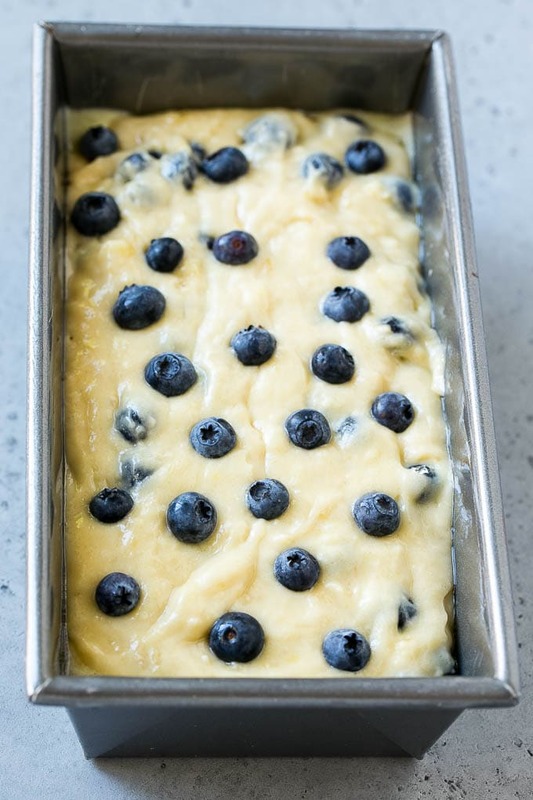 I add a few extra blueberries over the top of my batter before it goes into the oven, and the end result is the most beautiful loaf of banana bread you’ve ever seen! How do you freeze banana bread? If somehow you don’t happen to finish all of your banana bread, or you simply want to save some for another day, you can easily freeze your bread. You can tightly wrap the whole loaf in plastic wrap, then place in a resealable bag and freeze for up to 2 months. Thaw your bread at room temperature when you’re ready to eat. The other option is to wrap up individual slices in plastic wrap and store them in a resealable bag. You can them thaw your slices at room temperature or microwave them for about 20-30 seconds. Once you try this blueberry banana bread, you’ll never want to go back to regular old banana bread. My kids love to take this bread in their lunch and you can even add a little glaze and call it a dessert. 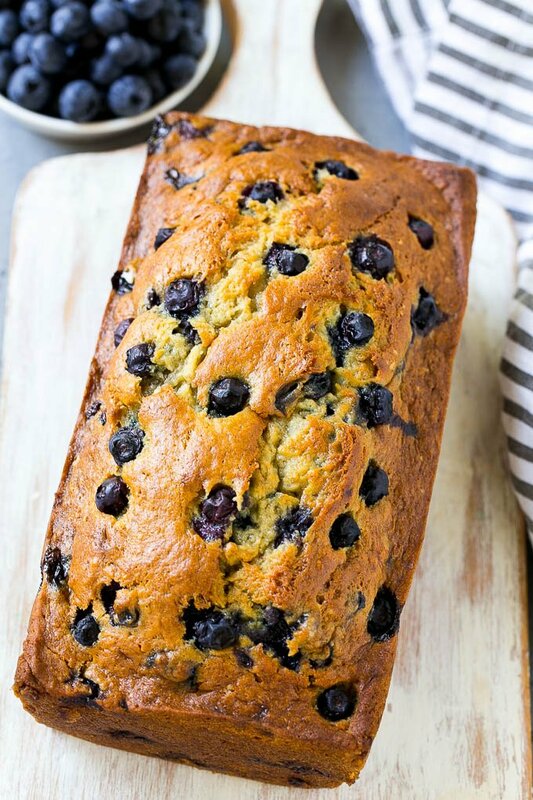 This recipe for blueberry banana bread is a moist loaf of the classic sweet bread that's chock full of juicy blueberries. It's the perfect snack or dessert option and can be frozen for later use! In a medium bowl, combine the 2cups of flour, baking soda, and salt. Place granulated sugar and butter in a large bowl, beat with a mixer at medium speed until mixture is fluffy and well blended (about 1 minute). Add mashed banana, eggs, yogurt and vanilla; beat until blended. Add flour mixture; beat at low speed just until moist. 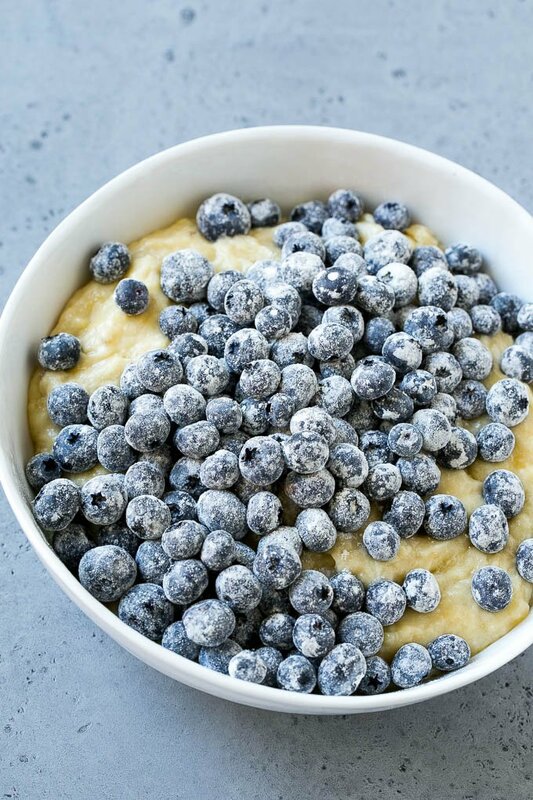 Place the blueberries in a bowl with 1 tablespoon of flour and toss to coat. Gently fold blueberries into the batter. Spoon batter into an 8 1/2 x 4 1/2-inch loaf pan coated with cooking spray. Press additional blueberries into the top of the batter for decoration. Bake for 60-70 minutes or until a wooden pick inserted in center comes out clean. Cool the bread 10 minutes in pan on a wire rack; remove the bread from pan. This post was originally published on January 27, 2016 and was updated on January 15, 2019 with new content. 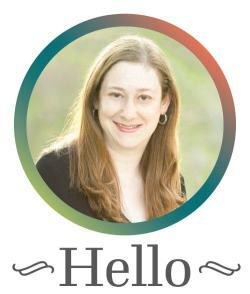 I made this last night for our small group and got so many compliments. It’s amazing! I did have to cook about 15 minutes longer in our oven. This is an excellent recipe. It is my “go to” for pot lucks, etc. At what temperature should we bake the cake? I make banana bread often but I have never tried blueberry banana bread before. So much like your kids, my family consumes banana like there is no tomomorrow, and sometimes I also either have to hide them or freeze some banadas in the freezer. Oh man! 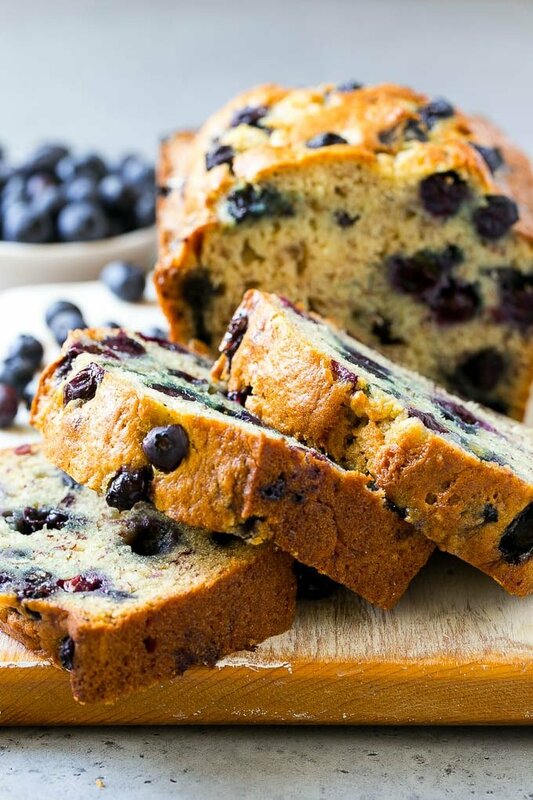 I need a slice of that blueberry banana bread now! It looks so yummy! I’ll try to bake it next weekends. This bread looks like it would be so good. I have never thought to add blueberries into my banana bread. This looks so yummy and rich! I wish I could have a slice for breakfast in the morning. Saving to try soon one day! Yummy! I love blueberry anything! Pair them with some banana bread and I really go crazy! Delish!